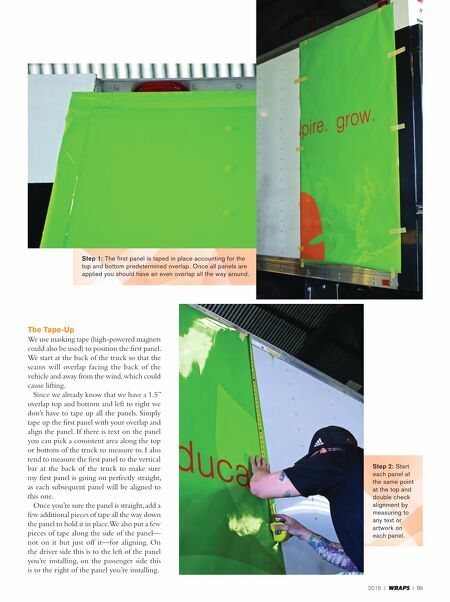 2015 I WRAPS I 99 The Tape-Up We use masking tape (high-powered magnets could also be used) to position the first panel. We start at the back of the truck so that the seams will overlap facing the back of the vehicle and away from the wind, which could cause lifting. Since we already know that we have a 1.5" overlap top and bottom and left to right we don't have to tape up all the panels. 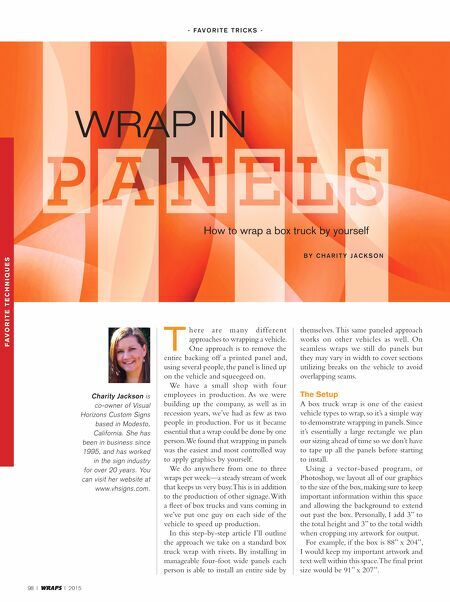 Simply tape up the first panel with your overlap and align the panel. If there is text on the panel you can pick a consistent area along the top or bottom of the truck to measure to. I also tend to measure the first panel to the vertical bar at the back of the truck to make sure my first panel is going on perfectly straight, as each subsequent panel will be aligned to this one. Once you're sure the panel is straight, add a few additional pieces of tape all the way down the panel to hold it in place. We also put a few pieces of tape along the side of the panel— not on it but just off it—for aligning. On the driver side this is to the left of the panel you're installing, on the passenger side this is to the right of the panel you're installing. Step 1: The first panel is taped in place accounting for the top and bottom predetermined overlap. Once all panels are applied you should have an even overlap all the way around. Step 2: Start each panel at the same point at the top and double check alignment by measuring to any text or artwork on each panel.